« Does your embedded development team’s project budget metric support your estimation process? I recently heard about another approach to providing feedback to touch interfaces (Thank you Eduardo). TeslaTouch is a technology developed at Disney Research that uses principles of electrovibration to simulate textures on a user’s finger tips. I will be meeting with TeslaTouch at CES and going through a technical demonstration, so I hope to be able to share good technical details after that meeting. In the meantime, there are videos at the site that provide a high level description of the technology. The feedback controller uniformly applies a periodic electrostatic charge across the touch surface. By varying the sign (and possibly magnitude) of the charge, the electrons in the user’s fingertip will be drawn towards or away from the surface – effective creating a change in friction on the touch surface. Current prototypes are able to use signals as low as 8V to generate tactile sensations. No electric charge passes through the user. By varying over time the electric charge across the electrode layer, this touch sensor and feedback surface can simulate textures on a user’s finger by attracting and repelling the electrons in the user’s finger to and from the touch surface (courtesy TeslaTouch). The figure shows a cross section of the touch surface which consists of a layer of glass overlaid with a layer of transparent electrode, which is covered by an insulator. 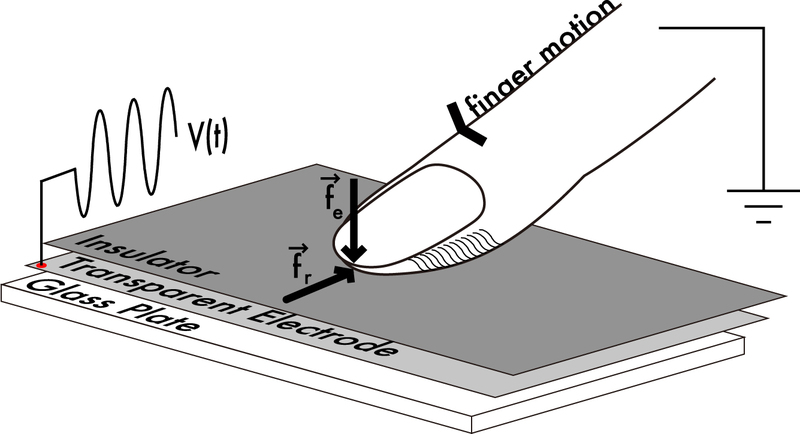 Varying the voltage across the electrode layer changes the relative friction coefficients from pushing a finger (Fe) into the touch surface and dragging a finger across it (Fr). It is not clear how mature this technology currently is other than the company is talking about prototype units. One big feature of this approach to touch feedback is that it does not rely on mechanical actuators typically used in haptic feedback approaches. The lack of moving parts should contribute to a higher reliability when compared to the electromechanical alternatives. However, it is not clear the this technology would work through gloves or translate through a stylus – of which the electromechanical approach can accommodate. What are the questions you would like most answered about this technology? I am hopeful that I can dig deep into the technology at my CES meeting and pass on what I find in a follow-up here. Either email me or post the questions you would most like to see answered. The world of touch user interfaces is getting more interesting each day. This entry was posted on Friday, December 17th, 2010 at 1:10 pm	and is filed under User Interfaces. You can follow any responses to this entry through the RSS 2.0 feed. You can skip to the end and leave a response. Pinging is currently not allowed.